As a Respiratory Therapist, there will be times when a patient presents to the ER with serious smoke inhalation. More times than not, these patients will show signs and symptoms of carbon monoxide poisoning and you will need to know how to treat them effectively. To help with that, we put together this study guide that is loaded with helpful carbon monoxide poisoning practice questions that can help you learn everything you need to know. It’s better to gain an understanding of this knowledge now, so that you can use it when these situations occur. Are you ready to get started? Carbon Monoxide is a colorless, odorless, nonirritating gas produced by the incomplete combustion of any carbon-containing material. It is harmful and can be very dangerous if a person inhales too much of this gas. 2. What is an abbreviation for carbon monoxide? 3. As a Respiratory Therapist, in general, when patients are suspected of carbon monoxide poisoning, what is the first thing that must be done to treat this patient? Give them 100% oxygen as soon as possible. 4. What are common sources of CO? Smoke inhalation in fires, automobile exhaust fumes, faulty/poorly ventilated charcoal, kerosene, or gas stoves, and temporary use of electrical generators. 5. What are some easy ways to prevent CO poisoning? Have home heating systems (including chimneys and vents) inspected and serviced annually by a trained service technician. Never use portable generators inside homes or garages, even if doors and windows are open. Use generators outside only, far away from homes. Never bring a charcoal grill into the house for heating or cooking. Do not BBQ in the garage. Never use a gas range or oven for heating. Open the fireplace damper before lighting a fire and keep it open until the ashes are cool. An open damper may help prevent the buildup of poisonous gases inside the home. Never leave a car running in the garage, even with the garage door open. Install battery-operated CO alarms or CO alarms with battery backup in your home outside separate sleeping areas. Know the symptoms of CO poisoning: HA, dizziness, weakness, N/V, sleepiness, and confusion. If you suspect CO poisoning, get outside to fresh air immediately, and then call 911. 6. What does CO do in the body? Binds to heme iron in hemoglobin with an affinity 250x that of O2, creating carboxyhemoglobin (CO-Hb) and causing tissue hypoxia. 7. What are the three mechanisms of CO-induced hypoxia? Presence of CO-Hb reduces oxyhemoglobin saturation and decreases blood O2-carrying capacity. CO-Hb shifts the oxyhemoglobin dissociation curve to the left, thereby impairing the dissociation of O2 from hemoglobin, impairing O2 delivery to the tissues. CO binds to cytochrome c oxidase in mitochondria and to myoglobin in heart/skeletal muscle. 8. How many oxygen binding sites are there for hemoglobin? 9. What does a left shift or a right shift on the oxyhemoglobin curve represent? Left shift: increased Hb-O2 affinity (O2 stays bound to Hb and cannot diffuse into the tissues); and right-shift: decreased Hb-O2 affinity (O2 has trouble staying bound to Hb and prefers to be in the tissues). 10. Why does the oxyhemoglobin dissociation curve not form a straight line? The binding of each oxygen molecule makes it easier for the next to bind, (affinity increases with each oxygen molecule bound) so the curve has to be curved and it shifts in either direction. 11. What is the description of how the presence of CO-Hb affects oxyhemoglobin saturation? CO-Hb reduces oxyhemoglobin saturation and therefore reduces blood O2 carrying capacity. 12. What is the description of how the binding of CO at one of the oxygen sites affects oxygen’s affinity for the remaining three sites? Oxygen’s affinity for the remaining 3 sites is dramatically increased (causing the O2 to stay bound and preventing it from diffusing into the tissues). This is similar to how when the 1st O2 binds to the site; it makes it easier for other O2 molecules to bind. The difference is that when it is only O2 binding, the affinity is not strong enough to prevent O2 from diffusing to hypoxic tissue. 13. What mechanism of CO poisoning can cause lactic acidosis? CO binds to cytochrome c oxidase in the mitochondria. This leads to impaired oxidative phosphorylation and causes the body to switch to anaerobic metabolism. This causes lactic acidosis. 14. What mechanism of CO poisoning can cause reduced cardiac output and hypotension? CO binds to myoglobin in the heart and skeletal muscle. 15. How does the CO-Hb complex dissociate after the removal from exposure? 16. How can the CO-Hb T1/2 be significantly decreased? Administration of O2 under pressure. 17. What are the initial symptoms of CO poisoning? Nonspecific symptoms such as HA, fatigue, sleepiness, dizziness, sweating, N/V, confusion, and memory problems. 18. What patients could also experience angina or a myocardial infarction due to CO poisoning? 19. What are the more severe symptoms of CO poisoning? Impaired thinking, loss of consciousness, coma, convulsions, hypotension, cardiac arrhythmias, and death. 20. What is a sign of CO poisoning that can be seen in autopsies, but is not seen in living victims? 21. What are two factors of CO exposure that determines the patient’s toxicity? The concentration of CO and duration of exposure. 22. What are the challenges of diagnosing a patient with CO poisoning? The only easy CO poisoning diagnosis is when the patient has a known history of CO poisoning. Otherwise, there are no specific clinical findings, and conventional pulse ox gives falsely normal readings. 23. What are some tests that can be done? Blood CO-Hb concentration (used for diagnosis) and other tests include EKG, blood electrolytes, glucose, and etc. 24. A patient with CO poisoning is found to also have metabolic acidosis. What does this suggest? 25. How is CO poisoning treated? Decontamination (removal of the patient from the exposure); maintain an open airway and assist ventilation if necessary; oxygen (high-flow 100% O2, tight-fitting mask); hyperbaric O2 to speed up CO elimination if CO levels are above a certain threshold; treatment of seizures if they occur; and, EKG monitoring. 26. What are some long-term consequences of CO poisoning? At higher risk of developing neuropsychiatric sequelae such as: persistent vegetative state, Parkinsonism, impaired concentration and memory, or mood disorders. 27. What is the mechanism of long-term consequences of CO poisoning? Lipid peroxidation of neuronal cell membranes. Hemoglobin bound to carbon monoxide. It is formed in the blood when carbon monoxide is inhaled, reducing the ability of the blood to form oxyhemoglobin. 29. What is the pathophysiology of carbon monoxide poisoning? CO rapidly diffuses across capillaries and binds to iron moiety of heme with 240 X the affinity of O2. CO binding to heme resulting in a diminished ability to offload oxygen from the 3 other oxygen binding sites (i.e. left shift of oxygen dissociation curve). 10-15% of CO is (reversibly) bound to myoglobin, cytochromes and NAPHH, resulting in impaired oxidative phosphorylation in mitochondria. In the heart, mitochondrial dysfunction due to CO can lead to myocardial stunning despite adequate O2 delivery. CO also inactivates cytochrome oxidase that impaired peripheral oxygen utilization. Delayed neurological sequelae (DNS) can arise during recovery from CO exposure (the mechanism is likely reperfusion injury). 30. What are the symptoms of carbon monoxide poisoning? Mild-moderate: headache, nausea, dizziness, poor feeding; severe: seizures, syncope, coma; can present with myocardial ischemia or arrhythmias; and, delayed neuropsychiatric syndrome. 31. What are the signs of carbon monoxide poisoning? Mental state changes are most common physical finding and “cherry red” appearance of lips and skin. 32. What is neuropsychiatric syndrome in CO poisoning? Occurs in up to 40% of cases within 20 days of significant exposure, features include cognitive deficit, behavior change, and focal neurological deficits. Symptoms may persist for 1 year. Cannot predict likelihood based upon initial carboxyhemoglobin levels. Often associated with loss of consciousness at the time of intoxication. 33. What is the diagnosis of carbon monoxide poisoning? Exposure and elevated carboxyhemoglobin levels. Pulse oximetry cannot distinguish between oxyhemoglobin and carboxyhemoglobin. 34. What is the management of carbon monoxide poisoning? CO becomes unbound when O2 competitively binds the Hb. HF O2 is standard treatment. 100% Hyperbaric O2 is used in severe or high-risk cases (carboxyhemoglobin>25%, loss of consciousness, end-organ ischemia, pregnancy). Consider and correct for cyanide poisoning (if due to smoke inhalation). Hemoglobin that is unable to bind O2 (due to oxidation of Fe2+ to Fe3+). The remainder of haem molecules will have an increased affinity for O2 (Left shift). 36. What are the common sources of carbon monoxide? The product of incomplete (internal) combustion of hydrocarbons (engine exhaust), fire, improperly adjusted heating elements, charcoal/gas grills, exposure to paint strippers containing methylene chloride and tobacco smoke (blood carboxyhemoglobin levels 10%). 37. What are changes to oxygen Hb dissociation curve with carbon monoxide poisoning? Because of its high affinity for Hgb, there is a left shift resulting in impaired O2 release at the tissue level with resultant cellular hypoxia. 38. What are the some more clinical signs and symptoms of carbon monoxide poisoning? Headache, nausea, vomiting, syncope, seizures, angina, pulmonary edema, arrhythmias and fetal distress if pregnant. 39. What is the treatment for carbon monoxide poisoning? Start treatment with O2 if gives any history of possible exposure, high PaO2 hastens the removal of CO from the blood, mild poisoning: will respond to treatment with 100% O2, those with neuro impairment, cardiac abnormalities or carboxyhemoglobin level >25% may require hyperbaric O2 therapy and 100% nonrebreather O2 or hyperbaric oxygen. Another are high concentrations of oxygen (half-life is reduced dramatically and 100% O2 by face mask or ET tube. 40. How do you get the diagnosis of carbon monoxide poisoning? First, you need suspicion. CO levels via carboxyhemoglobin (from blood at the scene is best). If increased, diagnostic level of increase correlates poorly with clinical status. >5% in non-smoker or >10-15% in smoker. Take blood at the scene as it is most useful. Elevated CO in exhaled air of the patient or in the ambient air at the scene also helpful. Level carboxyhemoglobin in anti-coagulated blood samples stable for several days and co-oximeter. 41. What kind of shift to the oxyhemoglobin dissociation curve does CO poisoning cause? 42. What can cause a left shift to OxyHgb dissociation curve? Decreased temperature, decreased 2 & 3 DPG, increase pH, and decreased PC02. 43. What can cause a right shift to OxyHgb dissociation curve? Increased temperature/2,3 DPG, PCO2, and a decreased pH. 44. What percentage of carboxyhemoglobin level (CO-HB) is concerning in non-pregnant? 45. What percentage of carboxyhemoglobin level (CO-HB) is concerning in pregnant? 46. What mechanism induces inhalation injuries above the glottis? Thermal or chemical and nasopharynx, oropharynx, larynx. 47. What mechanism induces inhalation injuries below the glottis? 48. What are the physical findings of carboxyhemoglobinemia? Carbonaceous sputum, facial burns, singed nasal hairs, signs of hypoxemia, rapid respiratory rate, nasal flaring or intercostal retractions, hoarse voice, grunting, rales or rhonchi, erythema or edema of oropharynx or nasopharynx and inability to swallow. 49. What are the four signs of hypoxemia? Agitation, anxiety, stupor, and cyanosis. 50. What diagnostic testing is not useful for CO poisoning? Routine ABG and pulse oximetry. 51. What is the diagnosis of carbon monoxide poisoning? Arterial or venous carboxyhemoglobin saturation. 52. What are indications to treat CO poisoning patient with hyperbaric oxygen? History of loss of consciousness, carboxyhemoglobin > 25%, metabolic acidosis, age > 50 and cerebellar findings on neurologic exam. 53. Does carbon monoxide poisoning occur in a specific time of year? No. It can happen at any time. 54. What are the physical properties of carbon monoxide? Colorless, odorless, tasteless, non-irritating and gas. 55. What are the most common sources of CO in deaths? Fires, automobile exhaust, defective heaters and incomplete combustion of burning products. 56. When is CO produced? Whenever organic materials are burned with an inadequate supply of oxygen necessary to produce complete combustion. 57. What are the sources of CO in the home? Furnace, charcoal grill, range, water heater, auto in a closed garage, fireplace, gas, clothes dryer, and etc. 58. How many deaths are caused by CO in the US per year? Approximately 2700 deaths (excluding fire deaths). 59. How many deaths caused by CO in the US per year are due to suicide? 60. How many deaths caused by CO in the US per year are due to accidents? 61. Are deaths due to CO more commonly because of suicide or accidents? Suicide is more likely the cause. 62. What is the most common suicide due to CO poisoning? 63. What are the mechanisms of action in CO poisoning? CO produces tissue hypoxia by competing with oxygen for binding sites on the oxygen-carrying hemeproteins (hemoglobin, myoglobin, etc.). Carbon monoxide displaces oxygen atoms. Hemoglobin is full of carbon monoxide and is unable to deliver oxygen to the cells. 64. What molecule does CO compete with oxygen for binding? 65. What has a greater affinity for hemoglobin between CO and oxygen? 66. How much greater is the affinity of CO for hemeproteins compared to oxygen? 30 to 500 times as much. 67. How much greater is the affinity of CO for hemoglobin compared to oxygen? 250 to 300 time greater. 68. How is CO a toxin? It is believed that CO has a toxic effect at the cellular level by impairing mitochondrial respiration. 69. What is the percent saturation of CO (% COHb)? It is defined as the percentage of hemoglobin combined with CO in the form of carboxyhemoglobin (COHb). 70. Is a lot of CO in the atmosphere required in order to produce high carboxyhemoglobin levels? No, there only needs to be a little. 71. What is the “normal” level of carboxyhemoglobin for smokers? Normal is at 5-6%, can commonly reach 10% and can even exceed 15%. 72. Are smokers more likely to have more CO in their body than nonsmokers? 73. What are the symptoms at 10% COHb? No symptoms. Heavy smokers can have as much as 10 to 15% COHb. 74. What are the symptoms at 15% COHb? 75. What are the symptoms at 25% COHb? Nausea and a serious headache, fairly quick recovery after treatment with oxygen and/or fresh air. 76. What are the symptoms at 30% COHb? Symptoms intensify. Potential for long term effects especially in the case of infants, children, the elderly, victims of heart disease and pregnant women. 77. What are the symptoms at 40 to 60% COHb? Mental confusion, weakness, loss of coordination and unconsciousness. 78. What are the symptoms at 60%+ COHb? 79. At what COHb % will someone die from CO poisoning? 80. What is the most common cause of CO poisoning resulting in death? 81. What is the second common cause of CO poisoning resulting in death? Inhalation of the exhaust fumes of vehicles. Most of these deaths are suicides. 82. Why do CO poisoning deaths sometimes have skin slippage? CO diverted into a vehicle or other small area can significantly raise the temperature of this space. This can account for postmortem skin slippage in some cases. 83. What are the important factors of the carboxyhemoglobin levels of persons who die from CO poisoning? Source of the CO, circumstances surrounding the death and health of the individual. 84. What are the autopsy findings of CO deaths? Cherry-red or bright pink livor mortis, elevated carboxyhemoglobin levels where in rare cases low or negative levels can be seen in individuals who have an opportunity to eliminate CO after the initial levels have caused irreversible coma and CO can produce intrauterine death of an infant even though the mother has survived. So there you have it! 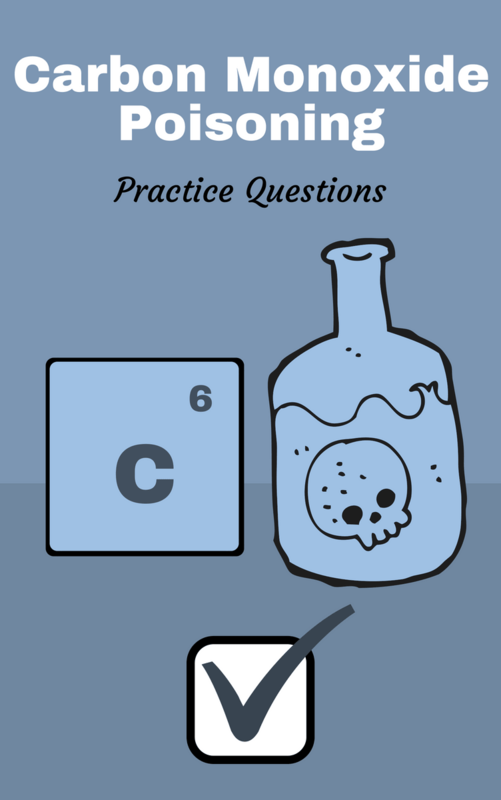 That wraps up our study guide on carbon monoxide poisoning and I hope that these practice questions were helpful for you. Go through them again and again until the information sticks. And the next time you see a patient with smoke inhalation and carbon monoxide poisoning, you will be there to do your job effectively and save lives if need be. Thanks for reading and as always, breathe easy my friend.